THERE IS NO CMLL STREAM ON FRIDAY. IT IS ON SATURDAY AFTERNOON. It’s also a loaded show, with every match having a chance of being really good. It’s not the only CMLL show moving dates. 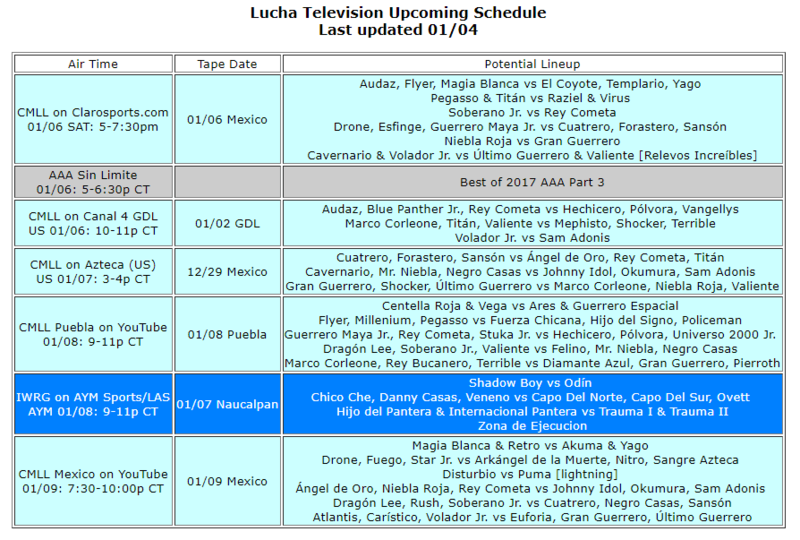 CMLL Lucha Azteca is now listed at Sunday at 3pm locally. I’m not sure if that’s the case everywhere; Azteca’s website still lists it as on Saturdays and you may want to check if you’re still watching the Friday repeat show. A new bunch of crime shows are running on Saturday afternoons instead, and it now has a sports recap show lead in on Sundays. AAA definitely will have new material next week, and might sneak some in this week. Tuesday Arena Mexico is the final show prior to people checking out for FantasticaMania.